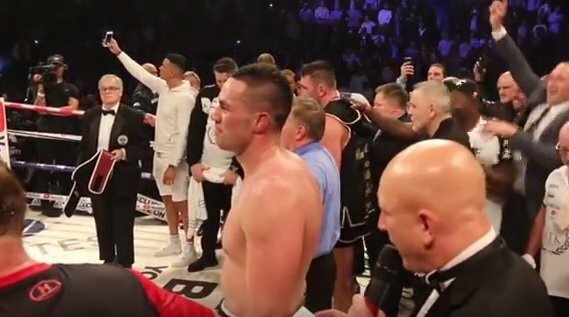 WBO heavyweight champion Joseph Parker could be looking at an estimated payday of $12 million for his unification fight against IBF/WBA heavyweight champion Anthony Joshua for their fight in March or April. According to the New Zealand Herald, Parker would be looking at a potential $12M payday for the Joshua fight, which is expected to take place in the UK. That would put the 25-year-old Parker above the $6 million that fellow New Zealander David Tua received for his fight with Lennox Lewis in 2000. With the money that Parker is getting for the Joshua fight, he’ll be set for life regardless of the outcome of the fight. For Joshua, this isn’t the first time he’s gotten a big payday. He’s been bringing in a lot of money since he first turned pro. But the paydays are getting increasingly bigger for the British heavyweight. If Parker makes $12 million, then Joshua could bring in over $20 million for their unification fight. With that kind of money, you must wonder whether Joshua will eventually have motivation problems. Joshua is no longer fighting for money. It’s now all about his legacy. There’s talk that Parker will be traveling to London, England for the kickoff press conference with Joshua in mid-January to announce their big unification fight. Parker will be getting between 30 to 35 percent of the purse for the Joshua fight. Parker’s promoter David Higgins has been in negotiations with Joshua’s promoter Eddie Hearn for over a month now to work out a deal that will make both fighters happy. Parker is viewed as a good heavyweight, but not on the same level as Joshua. Parker will need to show a lot more against Joshua if he’s to pull off the upset. Parker’s toughest fights of his career have been against Carlos Takam and Andy Ruiz Jr. Those were both close fights for Parker. He won but he didn’t impress the way the needed to for him to be a threat to Joshua. Takam is a good fighter. He gave Joshua some problems last October in their fight in Cardiff, Wales. Parker has the punching power to beat Joshua, and he’s got the stamina to potentially take him deep into the fight. Joshua has struggled with his conditioning in his last couple of contests against Wladimir Klitschko and Takam. There will be a great deal of interest from the other top heavyweights Deontay Wilder and Tyson Fury in the Joshua-Parker fight. Both of those large heavyweights want to face the Joshua-Parker winner in the near future.